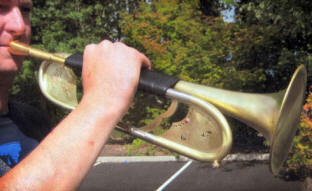 The wide array of mid-voice instruments on the market can complicate purchase decisions. Independent product reviews are presented below for the purpose of offering opinions about mid-voice instrumentation currently available on the market. If you are interested in purchasing an instrument for yourself or for your organization, this information will help you. This information will also be useful in helping end users learn about their instruments. Please contact us if you would like to have a specific instrument or accessory that you would like to see featured in a future review. "...worthy of consideration by any marching ensemble." "...The best results with this instrument are supported with a proper mouthpiece selection." "...I would have no hesitation about performing with a Quantum if I were a member of an ensemble featuring them." "...a very serviceable, cost-effective mid-voice alternative..."
"...a rebirth of the King 1120 model." "The revised flare makes a substantial difference in how the instrument projects and the tone colors." "Overall this is a brilliant horn...the 204 takes the Yamaha line up one step." "In short, it's a very nimble instrument." "...it is a forgiving instrument that would be well-suited for younger players in a sectional setting." "...the upper register above high A seems not to project all that clearly." "It does play well and, with the intended mouthpiece can create a unique sound of its own." "While the historical significance of the Conn 16E cannot be overstated, the instrument itself is flawed." "This is one über-funky monkey." "...an excellent alternative for those looking for a mellophone mouthpiece that produces a rich tone that can still cut in the louder dynamic ranges." "...there is both good news and bad news for middle hornists regarding this mouthpiece." "...it seems very likely this mouthpiece will adorn mid-voice metal for quite some time." "...a unique combination of a deep V-shaped cup and an extremely large throat." "The Hammond has efficiently and nearly instantly set the standard in modern mid-voice mouthpiece design." "Overall, this mouthpiece offers a deep, throaty sound that is compact compared to other popular mouthpieces available for the mellophone." "...an attractive accessory for mellophonists who tire of lugging around heavy cases by the handle."